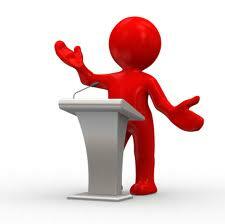 The assignment is to attend a speech, take notes and report in essay format on the speech. You are probably wondering "where can I find a speech to attend?" Look on campus, check our bulletin boards in class - you have to actually physically be in the room with the speaker!! Elements of culture - what culture does this person belong to? how has their culture changed their life? can you identify with their culture? if so in which ways? verbal elements of their culture? non verbal elements of their culture?